Cordova’s Chugach National Forest is truly a hiker’s paradise, with sixteen exceptionally well-maintained trails covering 35 miles of hiking. The District is nestled between the Copper River Delta and the southeastern end of Prince William Sound and covers approximately 2.3 million acres. Hiking through this temperate rain forest is a dream, with amazing Alaskan scenery and wildlife all around. From easy going boardwalks and flat stream side trails to towering forest and mountain peak adventures, there is a trail for all ages and ability levels. Cordova’s many trails all share one important thing in common: the trail heads are each easily accessible via car from the Copper River Scenic Highway. Before you take off into the woods for a day of hiking check with either the Cordova Visitor Center (907-424-7260) or the USFS Cordova Ranger District (907-424-7661) for the most current trail conditions. Be sure to pack for the weather and don’t forget your camera. Vistas abound! Perhaps one of the best hikes around Cordova begins right in town. From the Forest Service offices, you can follow signs up Council Ave. to the end of 6th street where you’ll find the base of the ski hill. In the non-skiing months, this hike is a favorite for all ages. You cross muskeg meadows and spruce forest, berry bushes and fireweed blooms as you reach the Midway point. Don’t forget to stop often and look back at the amazing views of Orca Inlet. When you reach the Midway, you can also gaze in the other direction at Eyak Lake and the Copper River Delta then turn around; or continue up to Top Station and beyond to Eyak Peak. Take a short – and gorgeous – drive out the Copper River Scenic Highway to the Sheridan Glacier Trail. This trail provides opportunities in all seasons to get up close and personal with a glacier. Feel the chill of a glacier pool and run your hands through pure glacier mud. If you pack a picnic you can eat your lunch along the edges of a glacial lake while taking in the expansive vistas of the moraine and listening to the sound of the cracking ice. Take the Copper River Highway to 13.7 mile, then follow Sheridan Glacier Road for 4.3 miles to the end. Two easy walking trails begin at the picnic area at the end of Alaganik Slough Road. The boardwalk trail is ADA accessible and allows hikers to traverse the fragile wetlands and observe the beautiful blooming wildflowers in spring and summer. An adjacent meadow trail takes hikers through the wetlands back to the secluded waters of Alaganik Slough. Both trails offer interpretive signs from the US Forest Service. Fisherman find this a favorite spot to catch coho salmon in late summer and so do the bears. Take the Copper River Highway to 16.9 mile, and turn south on Alaganik Slough Road. Follow the road 2.9 miles to the trail head. Not an official US Forest Service trail, this area is accessed via a small parking area near 0.5mile Whitshead Road. There is a small City of Cordova Water Department structure on one side of the parking area and a barricaded access road on the other. A somewhat steep walk up the gravel access road leads to a small water tower with a social trail on the hiker’s left. Continuing on the walking trail up another somewhat steep section, the trail then flattens out revealing meadows on the hiker’s left and a “Meals Reservoir” sign. This is the entrance to the Cordova Disc Golf Course, which consists of nine holes meandering through the meadows. Past this on the main trail lies the Cordova Reservoir. While using this area for recreation, please be sensitive to your watershed impacts. Remember this is our City’s drinking water and anything you leave on the ground or in the water will have an effect on the water. Please note: Due to a bridge washout, Child’s Glacier and the Million Dollar Bridge, Cordova, are currently only accessible via private guided trip. Child’s/Million Dollar Bridge are not accessible with your vehicle, RV or camper. 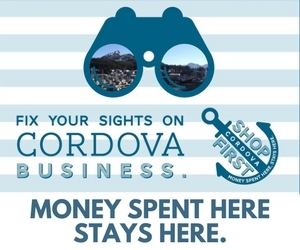 Contact the Cordova Chamber of Commerce or US Forest Service for information on planning a trip to Child’s Glacier and information on authorized guides.